Growing up, I remember having some amazing Christmases. I remember tiptoeing down the stairs, the Christmas tree lights twinkling, and looking for my Christmas gift from Santa. It was the only unwrapped present under the tree and the only one we were allowed to touch until my parents woke. We were also allowed to dig into and empty the contents of our stocking, which we did…all over the family room floor. I remember getting scolded by my parents when we woke up too early (4am is never too early to open gifts) and being told to go back to bed. While mom’s famous breakfast casserole was baking, we all opened presents, each one taking a turn so that everyone could oh and ah over the gift. Nana always ended up with a bow on her head, while Grandad was ever-ready with his pocketknife to help open those annoying toy packages. Dad would inevitably buy us something strange that mom knew nothing about (yes, we all got long johns one year). Grandma would quietly sit, snuggling with the closest grandchild, while mom anxiously waited to see if each present was received with as much enthusiasm as she thought it would. Christmas morning was magical in our household and I hope to pass on these traditions on to my children. During the time you date, become engaged and then marry, you unknowingly are subjected to your spouse’s family traditions. It might be the way his family eats as quickly as possible, and then clears the table before you even get to your entrée. It might be the place in their house that everyone congregates and enjoys time together. One tradition that our family has adopted from my husband’s family (actually my sister-in-law’s tradition), is that on Christmas Eve, the children open one present that always contains new pajamas. I prefer buying Christmas PJs because it makes for some pretty cute pictures in the morning. From his family: prime rib during the Christmas meal and Christmas PJs. From my family: one “Santa” present, systematic opening of presents, and Christmas toothbrushes. 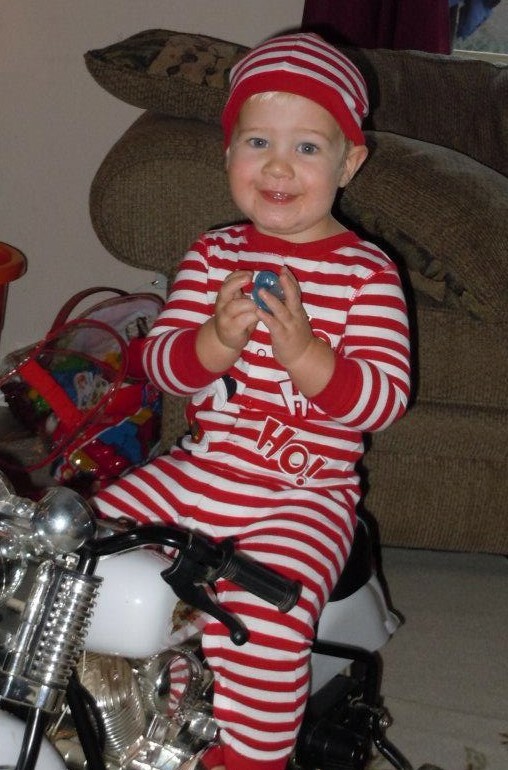 My son Davis in his Christmas PJs. See, I told you it made for some cute pictures! Christmas toothbrushes…… I realize you are probably giving me the side-eye right now, but hear me out. I’m fairly certain that my mom picked up the cheapest 4-pack she could (one for each of us) but man, was I excited to open that stocking and know that I was going to brush my teeth that morning with a new toothbrush. I know it seems miniscule, and I’m sure to our parents it was, but you can ask any of my sisters, it wasn’t. Coming from a large family, quite a few of our gifts were more needs than wants, but it didn’t make it any less special or Christmas any less exciting. That Christmas toothbrush tradition still continues to this day. As we all looked through our stockings (carefully prepared by my mother), not only did we find a toothbrush, but by golly, it was an electric toothbrush! We sat around discussing our presents and the contents of our stocking, and chuckled about the toothbrush. It just wouldn’t be Christmas without a toothbrush. It means more than just minty fresh breath or fewer trips to the dentist. To us, it brings back memories of every childhood Christmas and every precious moment spent with the ones we love. As we celebrated this Christmas with one fewer family member here on Earth, those memories meant even more to me. So for that, thanks Mom and Dad, for my Christmas Toothbrush and for making this Christmas and every Christmas before it, the Best Christmas Ever!